In the northern Great Basin, low sagebrush and mountain big sagebrush roll across the arid landscape, providing valuable habitat for hundreds of species of wildlife and productive grazing lands for livestock. A broad coalition of cooperators and contributors are partnering on landscape-scale removal of encroaching conifers to improve range health across borders in southeastern Oregon, northeastern California, and northwestern Nevada. Western junipers are encroaching into sagebrush rangelands, threatening sage grouse strongholds and agricultural operations. While junipers are native trees, altered fire regimes have allowed woodlands to expand ten-fold beyond their historic footprint, overtaking former sagebrush and grass-dominated habitats. As these conifers expand, they outcompete other native shrubs, grasses, and wildflowers for precious water resources and soil nutrients. Junipers are particularly problematic when they take over sage grouse breeding habitat, since the birds avoid lekking and nesting in areas with as little as 3-4% tree cover in the vicinity. Bighorn sheep, mule deer, and sagebrush songbirds also suffer when conifers outcompete sagebrush and perennial grasses, which provide important food and cover resources. The above map shows areas where conifers have been removed on both public and private lands throughout the Warner and Vya regions since 2013. Removing conifers before understory shrubs and grasses are lost improves habitat for sagebrush-dependent wildlife and preserves forage for livestock. Two different landscape-scale projects straddling the Oregon, California, and Nevada borders are strategically removing western juniper from places they don’t belong. Partners in these areas are prioritizing tree removal on former sagebrush sites in and around sage grouse strongholds where conifer encroachment is still in the early stages invasion (e.g., the tree canopy cover is generally less than 20%). To minimize the impact to sagebrush vegetation and soils, areas are treated primarily using chainsaws and the resulting slash is either scattered, or burned during the winter when the ground is frozen. Seeding is also occasionally needed to help reduce weeds. For the Warner project in southern Oregon, partners began scaling up conifer removal across private and public lands in 2011, while simultaneously monitoring the response of sage grouse and native sagebrush vegetation. Over 30,000 acres were identified for treatment, and the cuts are now 95% complete. In the Vya project area on the border of northern California and Nevada, work began in 2013 to cut encroaching conifers within 19 sub-project areas. Over 10,000 acres of sagebrush range have been treated so far, with another 10,000 acres slated for conifer removal to occur by 2019. The Vya and Warner habitat improvement projects are also outstanding examples of how to effectively integrate monitoring into on-the ground conservation. 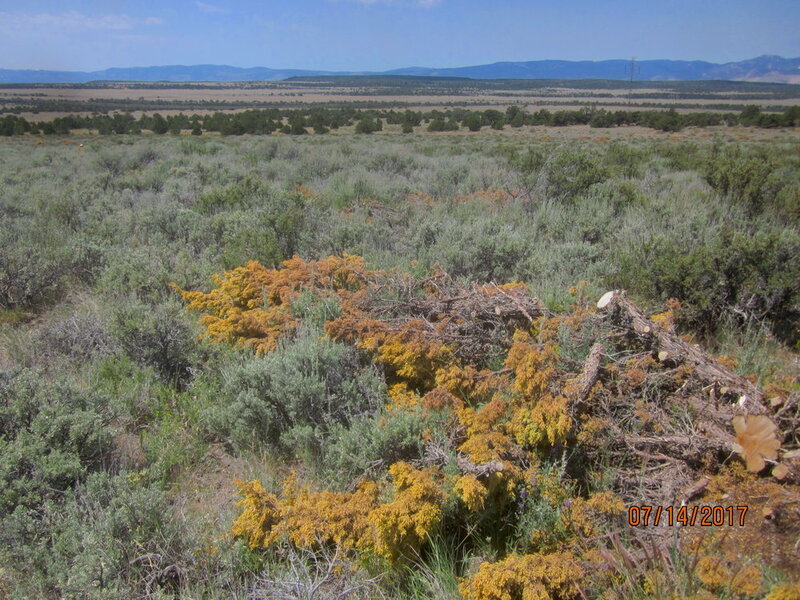 Ongoing studies are evaluating the long-term outcomes of conifer removal on sagebrush ecosystems. These research findings—which have appeared in peer-reviewed literature—provide valuable insights for conservation practitioners across the American West. BLM began radio-collaring birds in 2009 (prior to any conifer treatments) to study sage grouse movements. In 2011, a long-term study was initiated in partnership with NRCS, University of Idaho, Oregon State University, and Oregon Department of Fish and Wildlife to evaluate outcomes of land treatments. Within just three years of cutting conifers from rangelands, 29% of marked birds shifted back to nesting into treated habitats. Additional research also documented benefits of conifer removal for sagebrush songbirds: the abundance of Brewer’s sparrow, green-tailed towhee, and vesper sparrow more than doubled following mechanical conifer removal. This video shows the movements of two sage grouse hens in the Warner Mountains of southern Oregon. The birds were marked with GPS units, and traveled through a study area where encroaching conifers had been removed by the Sage Grouse Initiative. In 2017, BLM partnered with Oregon State University researchers in the Warners to extend their study south into the Vya region by placing GPS collars on sage grouse in the project area. Researchers tracked a hen that lekked in the Warner Valley then moved south to spend the summer at Cowhead Lake, an area treated for conifer in the Vya area, which shows the landscape-scale benefits of conserving habitat across boundaries. The University of Nevada Reno selected Vya as one of its study sites for a multi-year research project evaluating the broader wildlife response to conifer removal. UNR began collecting data in 2017 on how a variety of sagebrush-obligate species (such as insects, reptiles, birds, bats, and small mammals) respond to cuts.